oh, a month ago or so." another family. The Heckers live in what was once a milking parlor. small, concrete building into a cozy home. moving north from his home state of Oregon. from warm, rainy weather into cold snow." that would later become the state's largest city. except for the impressive, concrete Federal Building. a very different world in Alaska's Matanuska Colony. here where she met her future husband. had served four years as an Army engineer during World War II. 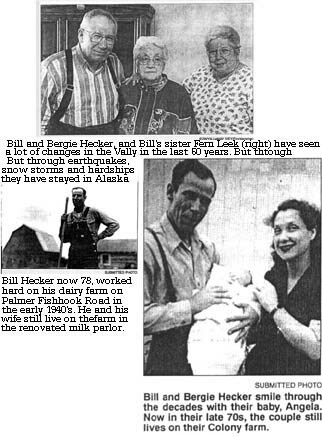 Heckers had bought the family farm after Bill's father died in 1948.
mother with the inside chores. He said dairy farms, like other farms, are rarely big moneymakers. "In order to make a living, you have to buy more cows," Bill said. "It's a never-ending thing," Bill said. made went right back into the farm." ly ease out of the demanding business. I didn't miss them one bit," he said of the dairy cows. small children bombarded her with fluffy snow. while sunlight glittered off their smiles. mountains add successful fishing trips. 78-year-old man cracked a small grin. said. She said Alaska is for the strong-bodied and brave-spirited. around them has changed dramatically. "It doesn't seem like the same place at all," Bill said. of them were even related to you." The elderly couple said they see few familiar faces anymore, however. and enjoy sunny skies during the heart of winter.